A FEW appearances for Ireland’s futsal team is the closest that Dane Massey has come to representing his country, as youth and U21 international football passed him by. 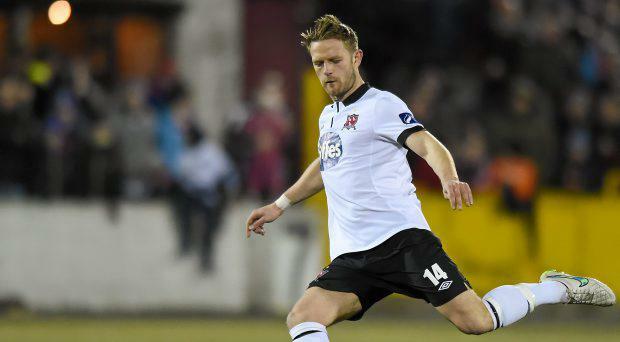 So it’s some leap for the 26-year-old Dundalk defender to be touted for a call-up to the senior Ireland squad, the case for Massey being made on TV recently, especially as Martin O’Neill has yet, in his 18 months on the FAI payroll, to attend a league game in Ireland. Massey and his team-mates will come under the spotlight tonight when the champions take on Shamrock Rovers at Tallaght Stadium, Dundalk looking a win which would put them seven points ahead of the Hoops. And the full back feels that Martin O’Neill would not have a wasted journey if he came on a scouting mission. “It was nice to hear myself mentioned in that respect and get a bit of recognition but there are players in the league should at least be looked at,” says Massey. “The FAI would have nothing to lose by at least having a look at some players here. I won’t let stuff like that distract me or take away from my own game, I am playing well at the moment and I don’t want to lose focus. “I think Martin O’Neill should have a look around. I feel we have players in the league who are worth consideration at least, whether they get capped is another thing but with the levels players train at now - our training is very intense - they wouldn’t be that far off,” added Massey. Of more importance to Massey and Dundalk this week is this trip to Tallaght tonight, followed by Monday’s game at home to Galway United. It’s very, very early days in the title race but ex-Bray man Massey knows that a win in Dublin this evening could send out a message in terms of Dundalk’s ambitions. A superb home record in Tallaght was one of the foundations for Rovers’ title successes in 2010-11 but a key game for Dundalk in their title win last season was a 1-0 defeat of Rovers at Tallaght, and Massey says the Dublin venue holds no fear for them. “We have always played well at Tallaght, it’s a great pitch - one of the better ones in the league - and you can only play good football there,” he says. “I love the matches there as the Rovers fans really get behind the team and that makes you want to play well. “The wide pitch there suits us, we will be well prepared for the game, we’re not afraid of the place by any means and we’ll go there confident and looking for the three points,” added Massey, eager to keep up a defensive record that’s seen Dundalk (and Rovers it should be said) concede just one goal. “Our back four have been superb all along and having Gary Rogers behind us is great, long may it continue,” he added.